RBTH now offers an edited transcript of the Voice of Russia's popular Red Line program. Red Line is a weekly discussion program airing on Voice of Russia radio. Each week, hosts Sergei Strokan, Mira Salganik and Ekaterina Kudashkina and their guests discuss the events of the past week, as seen from Moscow. Sergei Strokan: This week, we first sum up the results of the 47th annual Munich Security Conference; then, we discuss the much-debated memoir of one of the most outspoken heavyweights of U.S. politics, Donald Rumsfeld; and finally, we look at British Prime Minister David Cameron’s statement that multiculturalism in the UK is dead. First, we go Beyond the Headlines at the 47th annual Munich Security Conference. This year there was much less tension in Munich, and there was at least one visible result of the international efforts to enhance international security. 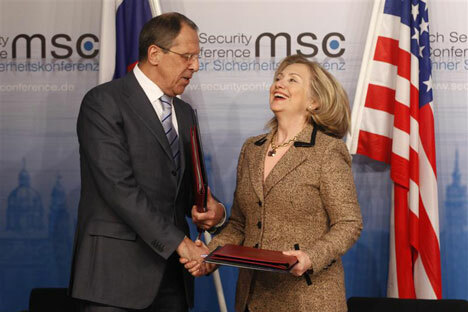 Mira Salganik: You mean the New START treaty, which came into force after U.S. Secretary of State Hillary Clinton and Russian Foreign Minister Sergei Lavrov exchanged ratification documents on the sidelines of the conference. Sergei Strokan: Just think: Under the treaty, two major powers, which currently possess more than 90 percent of the world’s nuclear arsenal, agreed to dispose of nearly one-third of their nuclear stockpiles over the next 10 years. This is really something. Mira Salganik: But New START in itself is not enough to make the process of world disarmament irreversible. What is needed is a two-fold move: the construction of a joint NATO-Russia defense shield in Europe and the signing of a new, comprehensive European security pact, which was proposed by President Medvedev shortly after he took office in 2008. In practical terms, the Munich conference showed that we are still too far from narrowing our differences on the anti-ballistic missile system (ABM) and European security pact problems. And what is even more alarming is that after this year’s Munich meeting, the gap in approaches to cornerstone international security issues grew even wider in a way. Judging by what I’ve read, Russia wants to create a joint missile defense system on equal footing with NATO. This would give Russia enough guarantees that the new system would not be eventually directed against it. Despite that, NATO is in no hurry to invite Russia either to collectively spell out a common list of threats and challenges, or to share the resources and technology needed for this shield. Mira Salganik: In the present global context, security is becoming a paramount need for all, yet what we are witnessing again are attempts to build security for one side at the expense of the other. Sergei Strokan: In Munich, Sen. John McCain, Russia’s “mortal friend” told Kommersant: “Russia’s objections are totally unacceptable and absurd. We should develop the system to defend ourselves and our European partners.” This was followed by Secretary of State Hillary Clinton’s statement that, despite Russia’s reservations, the first stage of ABM deployment, the installation of land-base radar systems and Aegis systems in Mediterranean Sea, would be started this year. Mira Salganik: And the interest shown to President Medvedev’s European security pact proposal, if I may call it “interest” at all, was very tentative, indeed. Sergei Strokan: Now we are joined by Alexander Gabuyev, the Kommersant correspondent, who watched the developments in Munich. Mr. Gabuyev, you met and personally interviewed Sen. McCain. What did he tell you about U.S. plans to build the ABM system and Russian reservations? Alexander Gabuyev: I met John McCain at the international security conference and we had quite a long conversation. He said Russia’s missile defense system proposal is rubbish and if Russia wants to cooperate with the U.S., it should do so without posing any challenges to the implementation of an already proposed Obama project. Sergei Strokan: And now we are joined by another Munich Conference participant, Alexander Rahr. Mr. Rahr, then-President Putin’s 2007 Munich speech caused a political uproar in the West. How has the situation changed? Alexander Rahr: Nobody remembers Mr. Putin’s speech in 2007 anymore. For some observers it was the beginning of a new Cold War, for others - a wakeup call for the international community to take Russian interests more seriously. I did not detect any negative sentiments towards Russia at this year’s conference, with maybe just one exception – in the speech of Georgian President Mikhail Saakashvili. Altogether, the conference was very productive: It was tangible that the “reset” button has been pressed and that there is a new constructive agenda for cooperation between Russia and the West. The conference broadly discussed issues such as the new nuclear shield that can be built jointly by Russia and the EU. Sergei Strokan: How has the vision of international security changed over these years? Alexander Rahr: All challenges have been broadly discussed. I think we no longer have the East-West conflict; we are moving towards a more specific North-South conflict, where powers like Russia, the EU and the U.S. should stand together to face the threat that will come from uncontrolled migration, drug trafficking, the proliferation of weapons of mass destruction and the attempts of some states to create nuclear weapons. After the global financial crisis, some states may face a crisis of resources and energy. All this is understood and I think the future Munich conferences will highlight these issues and ways to solve them. Mira Salganik: Mr. Rahr, the German chancellor and later the British prime minister spoke about Islamist extremism among their citizens. Do you think that was interesting for the Munich conference participants? Alexander Rahr: David Cameron spoke broadly about these problems. The British authorities are worried that international terrorism is not being imported to the UK, but that future terrorist attacks are being organized by British citizens of Pakistani or other Arabic origin. This is one of the greatest challenges for Europe, and also for Russia—how to deal with aggressive militant communities of Islamic extremists who hate European culture, even though they may have been born in one of the European countries. Sergei Strokan: To sum up the results of Munich conference, we turn to Vladimir Orlov, As a security analyst, how do you assess the results of the Munich conference? Vladimir Orlov: This is just a conference and not a place where decisions are made. It only provides for the exchange of ideas. I think today Europe is in a mood to build a new security architecture. In that sense, I am not completely convinced that President Medvedev’s proposal concerning a new European security treaty was fully well taken by the conference. At the same time, Foreign Minister Lavrov clearly emphasized the idea once again, referring to it as a cornerstone in rebuilding European security architecture. I am also not sure that most of the participants realized how important it is. Another thing is missile defense. When we talk about the reset, revival and improvement of bilateral U.S.-Russian relations, and more broadly Russia-NATO relations, keep in mind that differences remain. The two main differences are missile defense and conventional arms in Europe. Both should be and were addressed at the conference but again, I am not sure we have a successful breakthrough in the consolidation of those ideas, but then the question arises as to what other ideas and alternatives are. If no mutual understanding is achieved on missile defense in Europe, relations between Russia and the U.S. and Russia and NATO will go down again. Conventional arms are another issue of concern. The Treaty on Conventional Armed Forces in Europe (CFE) is outdated and should be rewritten. How this is going to be done is unclear. The conference demonstrated how far apart Russia, some of its European partners and the U.S. are in terms of these particular issues. Sergei Strokan: Now we turn to our Between the Lines segment where we discuss the most interesting publication of the week. This time we chose the column “Blame, Not Shame,” by Maureen Dowd of The New York Times. Dowd, a Pulitzer prize-winning columnist, writes about Donald Rumsfeld’s memoir, which takes “only 815 pages” to describe “Known and Unknown” events of Rumsfeld’s marathon political career in several U.S. administrations. Neither Mira nor I have read the book, but we are certainly familiar with the gist of the book, as well as with the career and political views of Donald Rumsfeld. Mira Salganik: I think it is mostly up to the American audience to judge his role in the Iraqi war and other hot-potato domestic issues. What matters for us here are Rumsfeld’s views and his unexplored role in U.S.-Russian relations. He visited Russia scores of times, starting during the time of Leonid Brezhnev. Sergei Strokan: But does it mean that Rumsfeld, as a man who for decades certainly was “in positions of responsibility in government” almost always had to do with incomplete information? If so, it explains a number of mistakes he is now blaming on others. To me, Donald Rumsfeld is more reminiscent of the Soviet party bosses – always right by definition, and if anything went so wrong that it had to be admitted, the fault was never theirs. The first time Rumsfeld visited the Soviet Union was in 1974, when then-President Gerald Ford traveled to Vladivostok to meet Leonid Brezhnev. Sergei Strokan: That was not just a photo opportunity summit. The visit had to do with the negotiations over Soviet-American Strategic arms limitation treaty (SALT-1), signed five years later on June, 18 1979. Today, we can say that the preconditions for SALT-1 – the fist world disarmament pact, were created by the Soviet-American Anti-Ballistic missile treaty of 1974, which did a good job for decades until the administration of George W. Bush withdrew from it. Mira Salganik: So, the 1974 treaty was to a certain extent the legacy of Donald Rumsfeld, which he had to give up while working as George W. Bush’s Defense Secretary. Sergei Strokan: Recently I came across a media report covering Rumsfeld’s visit to Moscow in 2001. At that time, the Pentagon head said in one of his interviews that in Russia there is still the old Cold War mentality. Mira Salganik: So, with Russia he showed the same approach as with Iraq – to put blame on others? Sergei Strokan: I don’t want to demonize Rumsfeld as Russian anti-American hawks constantly do. I highly respect him. He tried to defend American national security interests the way he understood them. Sergei Strokan: Now we are joined by Evgeny Buzhinsky, a retired lieutenant-general who was involved in negotiations with Donald Rumsfeld and the Pentagon team over top security issues. Donald Rumsfeld is considered to be one of the architects of national security strategies of different U.S. administrations. What was his role in spelling out the ABCs of American security? Evgeny Buzhinsky: Of course, Donald Rumsfeld’s role in formulating the military strategy of the United States is considerable. He was the defense secretary under Presidents Ford and Bush Sr. In this capacity, he played a significant role in this sphere. He also is considered to be one of the principal supporters, and I would say lobbyists and promoters, of the missile defense system. Even when he left the post of the secretary of defense, he was very actively engaged in lobbying for missile systems in American military and political circles. He has always been an influential and respected person. Sergei Strokan: As a top Russian military official, you participated in negotiations with Donald Rumsfeld and his team. In Russia, he is often portrayed as one of America’s notorious hawks. How relevant are these general observations? Evgeny Buzhinsky: Regarding the hawks and the doves, these clichésare used by journalists. I would call Rumsfeld, as he characterized himself: He is an old Cold War warrior. He seemed to be quite a reasonable man, but he was not cooperative on missile defense issues. He did not hear our reasons and arguments, while his arguments were the following: the Cold War is over, we are not enemies, we are practically partners and can become allies in the future; don’t be afraid of us, we will do what we want and plan. That’s all. Sergei Strokan: Donald Rumsfeld was a Republican serving in a Republican administration. Now, amid the ongoing reset of U.S.-Russian relations, how relevant are his ideas for the Democratic administration of President Barack Obama? Is there any consensus on the missile defense system and other issues? Evgeny Buzhinsky: As for Rumsfeld’s ideas about arms control, they are no longer relevant, since the Obama administration has other priorities. Arms control was one of Obama’s priorities when he was running for presidency and the START Treaty is good proof of that. As for missile related issues, there is actually a bipartisan consensus. Of course, the approaches of the current administration are a little bit different, but the general course of creating a global missile defense system is still relevant. I would say Donald Rumsfeld’s ideas are alive and being implemented. Sergei Strokan: I think Russian independent military analyst Alexander Golts can also add to this discussion. How did former Defense Minister Donald Rumsfeld influence the development of security doctrines in the US? Alexander Golts: Rumsfeld played a tremendous role in transforming the U.S. armed forces from one prepared for Cold War-style warfare to warfare conducted in unusual circumstances. He was extremely successful as a modernizer, but failed as a political analyst. After a victorious phase of military operations in Afghanistan, as well as in Iraq, there came a very unfortunate phase of occupation. And in this case, Mr. Rumsfeld behaved not as a far-seeing reformer but as an old-time colonialist. Sergei Strokan: Do you share the view of many Russian political analysts that Donald Rumsfeld was a hawk? Alexander Golts: I think this approach is not totally correct. Of course, Mr. Rumsfeld was a rather tough partner, but the reason for this was not that he thought Russia was a threat - on the contrary, he did not see Russia as a threat at all. His idea was that the two countries do not need any additional treaties or negotiations, because the U.S. dominated Russia in the nuclear field, as well as in the area of conventional armed forces. Sergei Strokan: As always we are concluding our weekly program with the segment Man in the News. This week our man is British Prime Minister David Cameron, whose speech at Munich suddenly put him in the spotlight of world media and sparked an unprecedented political storm in Britain. Sergei Strokan: It seems we are facing a new, pan-European phenomenon. In fact it is very simple. No one has a magic formula for peaceful coexistence between different communities living in mature, ageing European democracies that are unable to meet the challenges of the 21st century. This has obviously produced tension, hate crimes, violence and the growing radicalism of society. His idea is that Britain needs a lot less of the passive tolerance of recent years and much more active, muscular liberalism. Alexei Gromyko: Cameron’s statement in Munich on the failure of multiculturalism in the UK certainly caused eyebrows to raise in many quarters. The matter is that for many years, including the periods of Conservative rule, the UK has been very proud of its achievements in the sphere of multiculturalism. Cameron seems to have been proceeding from two principal factors. First of all, the Conservative Party is trying to limit the role of the British National Party and the Independent Party in terms of domestic policy. Secondly, it is true that previous British governments did not pay much attention to what was going on with the millions of people who have been settling in the UK over the last 15-20 years. Problems have been piling up and now David Cameron believes this is the right time to tackle these issues. I expect quite a nervous reaction in the UK. Some people will certainly applaud it, but it seems to me that the overall response will be very cautious and critical. Sergei Strokan: Is the crisis of multiculturalism, as Cameron put it, a pan-European tendency? Alexei Gromyko: In fact, the statement is in harmony with the views on multiculturalism of some other leading European politicians. For example, both Nicolas Sarkozy and Angela Merkel have already expressed their skepticism regarding the achievements of and prospects for the traditional approaches to the policy of multiculturalism. So what Cameron said is in tune with the growing discontent among the European general public and politicians on the immigration issue. At the same time, it seems that to play to the tune of the public mood in such a sensitive sphere is quite a risky business. But we see that Cameron decided to take the risk, to prove that by doing so, this policy of populism maybe attractive for the government in times of trouble.